Anny asked me to join her for a coffee after work and when I went there she gave me a piece of paper and asked me to read it. It was a printout of an email chain but I had no idea what it was about so I asked her to explain. She didn't want to tell me but suggested that I google the name of the company and find out what they do. Suddenly without even needing to google it, it all fitted perfectly in to place. The company was an adventure travel company based in France. 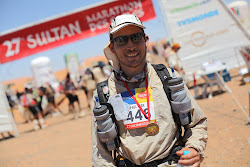 Several weeks ago we had been discussing whether or not Anny would join me at the finish of the MDS. The only viable way seemed to be to do it via the event organisers, who have put together a friends and family package. The cost was extremely high and I told her that she didn't need to come unless she really wanted to because of the cost. She said she would give it some thought and we could discuss it at a later stage. I had no idea that in the meantime she had been contacting the organisers and making the actual booking. When she told me tears almost came to my eyes. It means so much to me that she will be there to support me in my adventure and to share part of it with me. The package allows the participants not only to be at the finish, but also to meet with us at the classical concert that will be hosted on the penultimate day of the race and to see the start of the final stage. Seeing her one day before the end, I am sure that on the final day I will run like I am on fire. It will give me a real mental boost to know that she is so close by and to know that I will see her again at the finish line. With the fundraising good news and now this cool news from Anny, today has been a great day. Thanks Anny - you are a star!